First Listen: 'Red Hot + Fela' Nigerian bandleader Fela Kuti was a potent, prolific composer, so it makes sense that the not-for-profit Red Hot organization has followed its 2002 multi-artist Fela tribute, Red Hot + Riot, with this second volume. Kronos Quartet performs with Sahr Ngaujah (front) and Abena Koomson (center) at New York's Lincoln Center. Red Hot + Fela, a compilation album, comes out Oct. 8. Weed-puffing folk hero, energetic polygamist, political rabble-rouser and all-around badass, the late Nigerian bandleader Fela Anikulapo Kuti is one of the few figures to near-singlehandedly concoct an entire musical genre — in this case the magnificently propulsive, polyrhythmic Afrobeat. He was also a potent, prolific composer, so it makes sense that the not-for-profit Red Hot organization has followed its 2002 multi-artist Fela tribute, Red Hot + Riot, with this second volume. (Another reason is that Fela died of complications from AIDS, the disease Red Hot was created to fight.) The group has released 18 uniformly impressive benefit albums since 1990; the Cole Porter-themed debut Red Hot + Blue and 2009's eclectic Dark Was the Night, the latter curated by Bryce and Aaron Dessner of The National, are good starting points. Fela Kuti is the only artist to serve as the subject of two Red Hot sets. But the biggest reason behind this latest collection, no doubt, is the success of Fela! — the unlikely but spectacular musical that's seen multiple runs on Broadway and around the world, and helped make the man's sound more popular than ever. Afrobeat is part of Western pop vernacular, not uncommon as a backdrop for soul and rock singers or as bedrock for hip-hop samples. (And some may recall that Talking Heads took plenty of inspiration from Fela's music for 1980's Remain in Light.) In fact, many young bands devote themselves specifically to Afrobeat — most famously Brooklyn's Antibalas, which was eventually tapped by the producers of Fela! for the musical's on-stage pit orchestra. This backdrop may explain why Red Hot + Fela sounds both more faithful to, and more inventive with, this music than Red Hot + Riot, which sometimes forced connections between Afrobeat and other styles, particularly hip-hop. One of the new set's highlights is a strikingly straight reading of a 1972 deep-catalog cut, "Trouble Sleep Yanga Wake Am," by an unlikely trio: My Morning Jacket's Jim James, Alabama Shakes' Brittany Howard and tUnE-yArDs' Merrill Garbus. Given James and Howard's feel for vintage southern R&B (Fela was profoundly shaped by James Brown) and Garbus' feel for African styles, it's not as big a stretch as you might think. They nail the song's delicious, slow-motion soul groove, stretching it out for 14 minutes — two minutes longer than the original, for no apparent reason other than that it feels so damn good. In "Lady," tUnE-yArDs and ?uestlove tighten and loop the original groove, magnifying its hypnotic muscle, while Benin's Angélique Kidjo and globetrotting MC Akua Naru complicate the song's provocatively sexist lyrics. 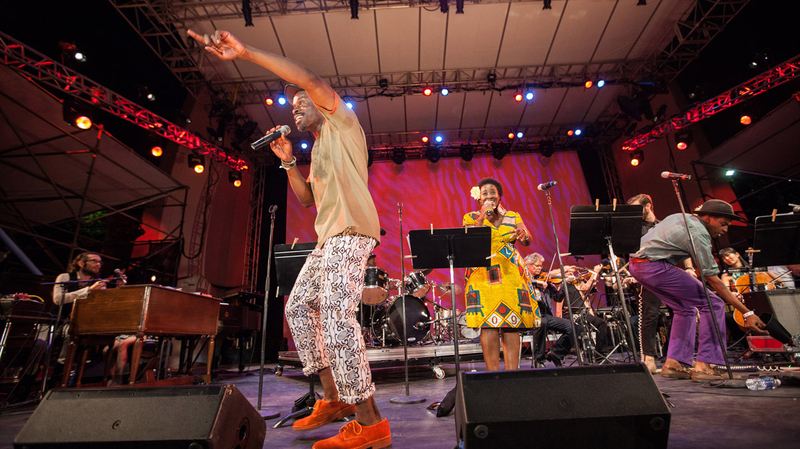 Elsewhere, young African artists retool Fela's music. The Belgium-based Congolese rapper Baloji and his band L'Orchestre de la Katuba weave heady Congolese guitar lines between chortling Afrobeat brass ("Buy Africa"), while Johannesburg fusionist Spoek Mathambo views two vintage tracks through the lens of modern club music ("Zombie," "Yellow Fever"). The most radical arrangement here also serves as the record's high point: a version of "Sorrow, Tears, and Blood" by Kronos Quartet with vocals by Tunde Adebimpe and Kyp Malone of TV on the Radio. The guitar lines of the original become pizzicato strings — the woody plucking sounding a little like mbiras — and the electric keyboard lines are transformed into lonely whistling. What's striking is how legibly the music is transformed while stripped to its bones; the melody and rhythm lose no power. The performance becomes a 21st-century blues, as well as a testament to the durability of Fela Kuti's music.